Based on some of literature's horror and science fiction classics, this is the story of a remarkable group of women who come together to solve the mystery of a series of gruesome murders and the bigger mystery of their own origins. Mary Jekyll, alone and penniless following her parents' death, is curious about the secrets of her father's mysterious past. One clue in particular hints that Edward Hyde, her father's former friend and a murderer, may be nearby and there is a reward for information leading to his capture...a reward that would solve all of her immediate financial woes. "Theodora Goss is a wonder. Her elegance, wit and powerful voice pull no punches. A brilliant, deeply felt, and nimble book." 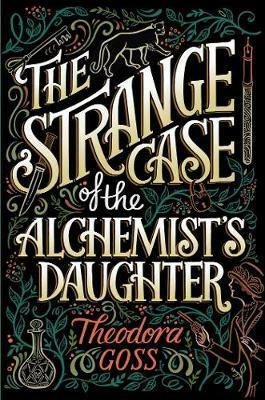 --Catherynne M. Valente, Hugo-Award winning author "Theodora Goss' The Strange Case of the Alchemist's Daughter provides a new and altogether mesmerizing revelation for fans of Watson & Holmes, Van Helsing, Jeckyll & Hyde, and Victor Frankenstein: until now, you've only heard half the story. Goss' deft, poetic interweaving of edge-of-the-seat adventure with the artful voices of her characters creates a matryoshka doll of hidden Gothic fiction in the best sense. The Strange Case of the Alchemist's Daughter proves the point that behind every evil genius you'll find a team of fantastic women working to set things right. As if Charlie's Angels, as written by Mary Shelley, took over the Bluestocking Society, with bonus well-mannered explosions. An utterly delightful, transformative read." --Fran Wilde, award-winning author of Updraft, Cloudbound, and Horizon "Theodora Goss' splendid debut novel is a whipsmart look at the truths hiding in the stories - Jekyll and Hyde, Frankenstein, and others - that you might think you know. Full of bravery, adventures, monsters, and sisters, The Strange Case of the Alchemist's Daughter is a rich delight. I loved it, and I can't wait to read the next book." --Kat Howard, author of ROSES AND ROT Theodora Goss' splendid debut novel is a whipsmart look at the truths hiding in the stories - Jekyll and Hyde, Frankenstein, and others - that you might think you know. Full of bravery, adventures, monsters, and sisters, The Strange Case of the Alchemist's Daughter is a rich delight. I loved it, and I can't wait to read the next book. --Kat Howard, author of ROSES AND ROT"